A stunning landmark co-publication between the American Society of Plant Biologists and Wiley-Blackwell. The Molecular Life of Plants presents students with an innovative, integrated approach to plant science. It looks at the processes and mechanisms that underlie each stage of plant life and describes the intricate network of cellular, molecular, biochemical and physiological events through which plants make life on land possible. Richly illustrated, this book follows the life of the plant, starting with the seed, progressing through germination to the seedling and mature plant, and ending with reproduction and senescence. This “seed-to-seed” approach will provide students with a logical framework for acquiring the knowledge needed to fully understand plant growth and development. 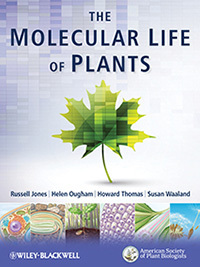 Written by a highly respected and experienced author team The Molecular Life of Plants will prove invaluable to students needing a comprehensive, integrated introduction to the subject across a variety of disciplines including plant science, biological science, horticulture and agriculture.